Twice as good – Hello Korea ! IMG_0441, originally uploaded by Almost-Human. Only, I haven’t been able to get any because it only comes in COUPLES sized orders. Yesterday, walking around Bukchon after going to the Museum of Culture, I found myself in a neighborhood where all the restaurants were closing at 5 pm. And on top of that, the restaurants were up-scale and expensive. So, about to have a food emergency, I went for it – I went for the couples sized order of fried chicken. The way they fry chicken here is they dip it and fry it twice. So if you’re into the crispy fried batter portion, you’re really going to like fried chicken here. I didn’t get the chicken on the bone, but these cut up pieces, so the meat in mine was a little over-done for my tastes, but this is just one of many fried chicken places. Also, the dish I chose, after being fried twice, is then tossed in a sweet chili sauce that is really yummy. 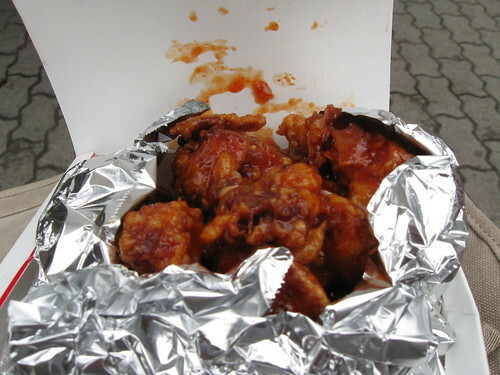 Two boxes of this, one with glaze, one without, a side of white sweetened & brined radish and a pepsi cost me 15,000 won. (almost $12 bucks – yikes!) But it was enough to feed two football players. And, for those of you fried food lovers (David!) You would love one of the street food items you can get. (I’ll try and photo it next time I see it) Basically, it’s a hot dog on a stick that’s been battered and fried. OK. You’ve seen that before. Now, before it’s cooled, completely roll it in french fries and smash them onto the battered hot dog. Then roll that entire thing in batter and fry it again. It’s a crunchy battered fried masterpiece. Very popular with the young boys. i love that the homeless man was potentially grumpy bc of lack of condiments! lol! I think it’s equivalent to me giving you BBQ chicken without sauce…You’d be hurt and confused as well! I DID remember to give him chopsticks, though!